Japanese company Akazawa is selling an 18-jointed, 73cm robot named PLEN, which can be operated via Bluetooth and several au mobile phones. 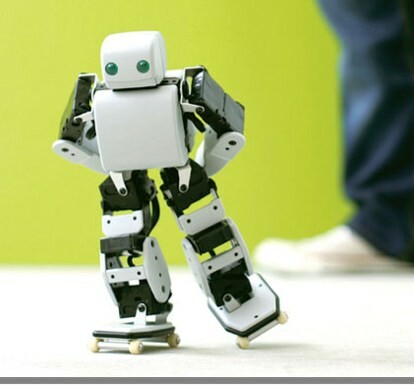 Billed as a desktop hobby bot, PLEN can roller skate for about 25 minutes on a single charge of his battery, kick balls by himself and knock your coffee all over your keyboard. All that for ¥262,500. The machine-translated online reservation form is here. Only 50 units are available initially. Derik's Thoughts: Awesome. I have to admit, I keep misread "kick balls by himself". I think you know how.